When Chancellor Michael Drake departs UC Irvine this month to become president of The Ohio State University, he’ll leave behind a campus that – despite considerable budget challenges – has grown in both size and stature. During Drake’s nine-year tenure, UC Irvine has seen applications for undergraduate admission jump by more than 90 percent and its four-year graduation rate increase by about 20 percent. Just over the past five years, the number of undergraduates from underrepresented minorities has risen by about 60 percent. Drake oversaw creation of the first new public law school in California in more than 40 years and led the launch of programs in public health, pharmaceutical sciences and nursing science, as well as the formation of the School of Education. Under his watch, UC Irvine added more than 5 million square feet of new construction, including the nearly 500,000-square-foot UC Irvine Douglas Hospital and the 275,000-square-foot Student Center. The campus also has received nationwide acclaim for its environmental sustainability and boasts an impressive 11 buildings that have earned LEED Platinum certification, the highest possible. A champion of diversity and dialogue, Drake helped develop the School of Medicine’s innovative Program in Medical Education for the Latino Community, which aims to improve healthcare for Latinos in California; he launched PRIME-LC when he was UC vice president of health affairs. He’s also supported the student-led Olive Tree Initiative, which fosters understanding among those with differing views on the Israeli-Palestinian conflict. Drake established the Living Our Values awards to honor employees who best demonstrate the qualities he has promoted since his arrival: respect, intellectual curiosity, integrity, commitment, empathy, appreciation and fun. A national search is underway to find his replacement, and Provost & Executive Vice Chancellor Howard Gillman has been named interim chancellor. After UC Irvine’s commencement ceremonies, Drake and his wife, Brenda, will embark on a new adventure in Columbus, Ohio. For the cycling enthusiast, it’s been quite a ride. Here are some parting comments from students, faculty and friends of UC Irvine and Chancellor Drake. “In the midst of trying times for the university, Chancellor Drake was always a faithful partner to students. He was a regular attendee at major student events, dazzling students with quotes from OutKast lyrics and setting fashion trends with his snazzy bow ties. “Chancellor Michael Drake will go down in history as having led UCI through one of the brightest and most successful periods of its existence. “Under his leadership, the university cemented its position as a global research powerhouse, rose in national and international rankings, increased student and faculty diversity, built a nationally ranked medical center and added a number of schools, including its nationally acclaimed law school and new School of Education. “His open-door policy and friendly demeanor endeared him to students and faculty alike. In addition to his administrative duties, Chancellor Drake maintained his love for teaching and co-taught – with Dean Erwin Chemerinsky – a freshman honors class titled The Supreme Court & the Civil Rights Movement. It’s one of the most popular classes at the university. “Under Chancellor Drake’s guidance, UC Irvine Health (the School of Medicine and medical center) over the past five years has witnessed one of its finest periods. Our service to the community, research and clinical facilities, and medical education capabilities have all greatly expanded. “One of the great privileges of my life has been the opportunity this past year to work with Michael Drake. His contributions to higher education over an extraordinary career are the stuff of legend, and his particular impact on the dramatic upward trajectory of UCI – during a period that included great budgetary challenges – will stand in our history as a model of the importance of outstanding leadership in the development of a great university. “Charming and funny in front of large groups, charismatic and infectious in small-group settings, Chancellor Drake is highly effective at articulating the value of public higher education, which underscores his success in fundraising for UCI. “His background in the health sciences made him a great fit for leading UCI’s medical school and medical center into a new era. … In strong teamwork with Michael Gottfredson [former executive vice chancellor & provost], he overcame formidable obstacles to add a law school and a school of education to UCI. 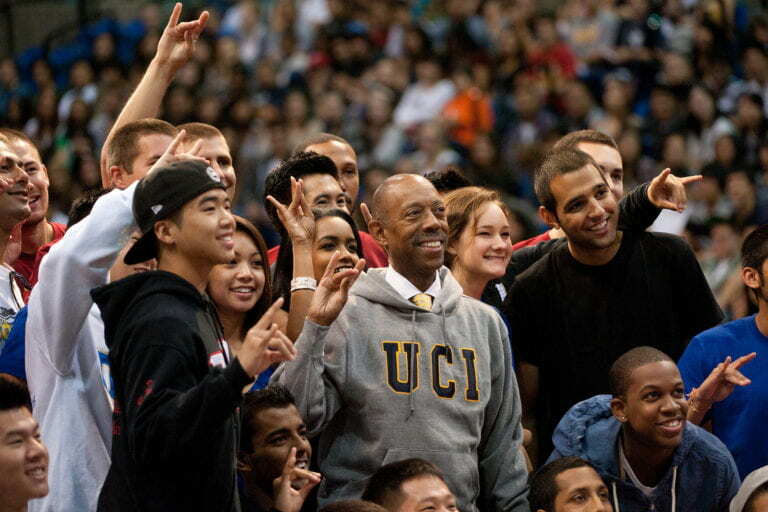 “Chancellor Drake has made the promulgation of values a hallmark of the UC Irvine experience. The seven campus values that he suggested at the time of his appointment – respect, intellectual curiosity, integrity, commitment, empathy, appreciation and fun – have become essential parts of fostering the creative process; building stronger bonds between people; and inspiring a shared sense of purpose among faculty, staff and students. “It was an honor and privilege to be able to serve with Chancellor Drake during our tenures. He acted as both a mentor and a partner and was readily available to discuss and take action on how we could better serve the student body. Notably, he always stressed the importance of maintaining the quality of student life, despite difficult budget times.